Cook rice as directed on package for two servings, using 1/8 teaspoon salt, but omitting butter if called for. Meanwhile, in medium microwavable bowl, mix chicken, black beans, 1 cup salsa and chili powder. Microwave on High 2 minutes or until hot, stirring after 1 minute. Place cooked rice in large bowl; stir in cilantro and lime juice until well blended. Heat tortillas as directed on package. Spoon about 1/2 cup chicken mixture down center of each tortilla. Top with about 1/4 cup rice mixture and 2 tablespoons cheese. Fold sides of tortilla toward center; fold ends over. Serve with additional salsa, if desired. What is Healthified? : We've replaced ingredients with great-tasting alternatives to create better-for-you recipes that are just as yummy as the originals. 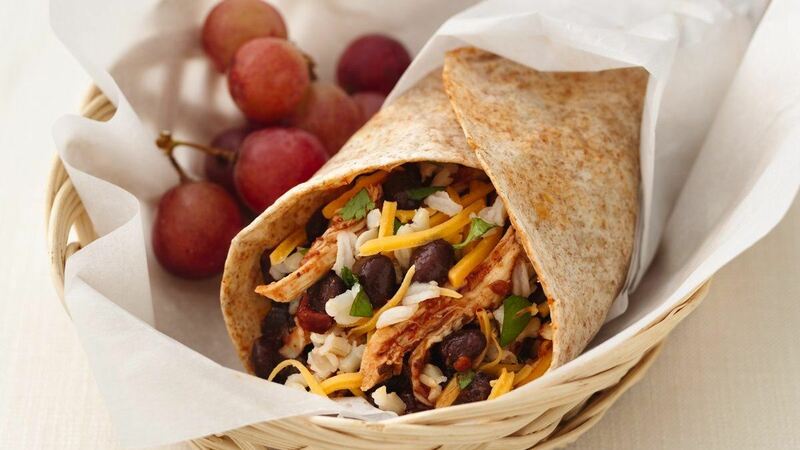 Substitution: Any type of beans can be used in place of the black beans, though smaller beans work best in burritos and wraps. Variation: Spice up these burritos by adding a little more chili powder and cilantro.